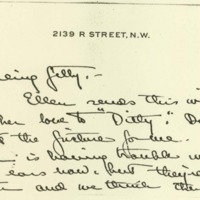 Eleanor Wilson McAdoo writes Jessie Wilson Sayre to thank her for her visit. Ellen sends this with all her love to “Ditty.” Don't forget the picture for me.Ellen is having trouble with her ears now, but they're getting better and we think they won't give us much trouble. I'll write again when I have more time. It was heavenly having you here, darling, but I have felt lost since you left. McAdoo, Eleanor Wilson, 1889-1967, “Eleanor Randolph Wilson McAdoo to Jessie Woodrow Wilson Sayre,” 1917 January 11, WWP17541, Jessie Wilson Sayre Correspondence, Woodrow Wilson Presidential Library & Museum, Staunton, Virginia.